Before focusing efforts on Modern Warfare 3, Sledgehammer Games was working on a creepy Call of Duty. Speaking with Gamerzine at the Call of Duty XP event last week, Sledgehammer Games boss Glen Schofield revealed that his studio's mysterious third-person Call of Duty game shared a few elements with Visceral Games' Dead Space series. 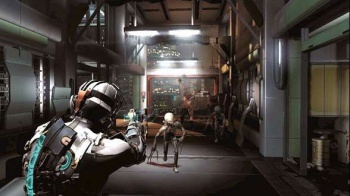 "It was a third-person action-adventure game, it was a shooter, and it was not based in this era," said Schofield. "It had a lot of atmosphere like, I should say Dead Space a little bit because you were underground in some places. You know, war is hell, war is scary and that's what we were trying to get across." "I want to make at least one more first-person shooter," Schofield said regarding the his future involvement with the Call of Duty series. "I want to get really good at it ... I would definitely, 100% work with Infinity Ward again because they're just the best. But I wouldn't mind giving Sledgehammer a shot on something." I'm pretty certain terrorists aren't as jump-out-at-you scary as necromorphs. Zombie terrorist infants, on the other hand, would be a different story.